Look directly below the Flag. Their is a white bag there that is making this thing float! I kept expecting you to follow "I have tried everything," with "including smoking crack." ETA: Stink. I was hoping to be pope so I could officially ask for guesses as to how many that thing will carry - 40 seems like a big ask. Can I unofficially ask for guesses? Last edited by ggh on Wed Jul 24, 2013 10:02 am UTC, edited 2 times in total. This is an interesting study in how the OTC has morphed - slinches ottified the same song waaaay back during the Fading. And that's definitely the sandcastle platform thingy. Just in time to... what is it you kids are saying these days? "Muppet down"? I look forward to the exciting revelations when I, uh, "muppet up" later this morning. (Seriously though, a molpygnathus makes me thing of some kind of prehistoric burrowing swine). BlitzGirl wrote: The main difference is that the kids have gotten excited - the little-moving boy stood up and Mini-Bunny moved up to see better. The obscured woman behind the tallest Bangs Brother also moved closer. It appears that LaPetite has lashed something to the front of the "ship" - maybe something buoyant like an extra bag. I am not sure how the Cueganites want to deal with the current. Floating isn't a good solution. As already has been pointed out: They may end - after a long journey - in Dutch-Italy. They don't necessarily have to just float. 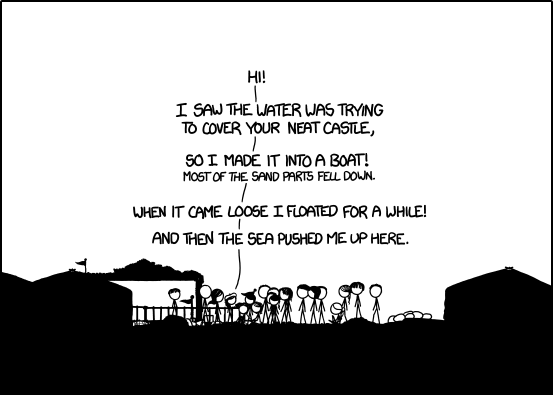 They can still walk inland in front of the rising water, and use the sandcastle only when necessary (i.e. when crossing rivers) and to carry supplies, dragging it behind with ropes. Floating out to the sea would definitely be a bad solution, but there is certain appeal in arriving to the Chateau d'If by a boatcastle. Pfhorrest wrote: (Seriously though, a molpygnathus makes me thing of some kind of prehistoric burrowing swine). They are fond of disappearing into their burrows. Substitute "apoca-futuristic" for "prehistoric" and you're right on. Last edited by BlitzGirl on Wed Jul 24, 2013 10:07 am UTC, edited 1 time in total. Hmm, that is a weird place for a master assassin. She probably has a plan to kill them that requires her to be at the center of attention. rvloon wrote: "Paint It Black"
ETA: Oh, and W T!!! Don't you wish you had kept that beret I gave you so many NewPages ago BlitzGirl. It could be you saving the day now! Paddles? Possibly wheels to make it an amphibious craft? I'm 84 newpages behind in the OTT. LaPetite. Has turned the Sandcastle Scaffold. Into a boat. I don't even know what to do with myself, so I suppose for now I'll just have to coma for a bit. But will it hold all of them?? I didn't tell you this is redundant. Also is it just me or are the delurkers delurking more often these dips? I'm now passing my blindpost of page 1209. I guess I'm officially medi-blitzing. (medium blizting, being bigger than a mini-blitz but definitely not a full-on blitz). Wow, a lot of stuff has been happening. So many walls of text. I would have almost expected GLR to make put just 1 or 2 lines of the dialogue per newpic rather than so many on a single one, but we're now in the era of RUN rather that Wait For It so it makes sense to have everything happening faster. Eventually so much will happen at once that there'll be black everywhere. Thus ends time. I clicked the next page and there it is: a newpic of all black!! pelrigg wrote: Yes, there's been a dozen or more firstposts in the past 48 Newpix. I think this the greatest number since the fading. Thanks for the "nicely done." Now what exactly did I do? It's not like my first ONG. What you did is post on 3000.00. A little slower and it would have been a less-round 3000.01 for example. ETA taixzo great OTTification of Still Alive! Last edited by Eternal Density on Wed Jul 24, 2013 10:27 am UTC, edited 3 times in total. If a month or so ago someone had told me "Megan and Cueball meet these weird guys with matching hats who talk in weird symbols and take them to a huge castle to meet their leader who tells them the sea is rising because of a huge cataclysmic event so they have to run to save their people and then LaPetite turns their sandcastle platform into a boat and turns up to save them all", I'd have thought they were having a laugh. Flotter wrote: Almost looks like a sailor. manvandmaan wrote: Looks a bit like a sailor's hat! Could it be a seaman? You, my good sirs, were right. LaPetite's hat, the only hat among the Twenty (and perhaps even the Forty) is not just any old beret, but a genuine sailor's beret! yappobiscuits wrote: I had some artistic urges, so here's a present present! This is awesomefully neat. Wowish job! Bonus comment: Voice work, oh wow, so that's what you sound like (when talking). Wowzer...(damn, I'm sounding sarcastic. Just being playful, sorry.) Your sound would be great as a narrator (if Time had one ), it feels very Thomas the Tank Engine (not Ringo though). Didn't LaPetite drag some round things in the final frame of the Fading? (Once thought to be Megan's and Cueball's heads.) Maybe the round things were wheels, so this is an amphibiraft? But I guess something that floats makes more sense. Oh, and I can see LaPetite and BlitzGirl at the same time, so they are not the same person after all. New theory: BlitzGirl is really PizzaGirl from Questionable Content; the names sounds similar (especially if said while eating pizza). EDIT: Ninja'd by NetWeasel about possible amphibiousness. Last edited by mikrit on Wed Jul 24, 2013 3:46 pm UTC, edited 1 time in total. Thanks for the accolades on Paint it Black, people. Too bad nobody laughed at my Approxalypse or saw Saint Nicholas on his boat. I guess LaPetite's return made even a one-out-of-three acknowledgement no mean feat. Is there a TVTropes EveryonesFavoriteCharacter? I think LP would win, hands down. Which is also quite remarkable as she only appeared before during a fade-out for about 3-5 newpices. What if she is Evil? Or Megan's Evil Twin Sister? Will you get me right out of this Godforsaken plain? I'm so sick of black and white! Can you build a sand castle with these grains of sand? Will ya hose me down with seaish water, if I get too hot? Last edited by rvloon on Wed Jul 24, 2013 10:33 am UTC, edited 1 time in total. Yay I've caught up to my second signpost! BTW did anyone see my Firefly Online related screenshot a while back? mikrit wrote: Oh, and I can see LaPetite and BlitzGirl at the same time, so they are not the same person after all. New theory: BlitzGirl is really PizzaGirl from Questionable Content; the names sounds similar (especially if said while eating pizza). Which means she's also Penelope! azule wrote: This is awesomefully neat. Wowish job! ETA: @Ronald, that would be I'd Do Anything For Love (But I Won't Do That)! And good job! Last edited by yappobiscuits on Wed Jul 24, 2013 10:35 am UTC, edited 1 time in total. Prediction time! I reckon they all sit around gathering supplies, knowing that when the water gets too high they can all jump on LaPetite's raft and set sail. (Speaking of which, we should name the raft. I vote for 'La Boulangerie', as a reference to bakery/beret guy) Anyway, they set sail and become pirates of the high seas, with Megan as their captain and Cueball also as their captain. I don't follow Questionable Content, so I don't know exactly what y'all are talking about, but I do like pizza! rvloon wrote: What if she is Evil? Or Megan's Evil Twin Sister? The good/evil twin is an awful dichotomous stereotype. Woo back in the present. Briefly. BlitzGirl wrote: I don't follow Questionable Content, so I don't know exactly what y'all are talking about, but I do like pizza! I still don't believe he is, and the introduction will be "Hey!". BlitzGirl wrote: The good/evil twin is an awful dichotomous stereotype. Only the evil twin would say that! I deny everything: LaPetite, evil twinness, and Pizza Girl! All denied! Also, I'd like to mention that I totally called LaPetite being the cousin. GLR seems to not be big on names -- I'm not either, that's how I noticed. If you are talking one on one, names aren't necessary, and most of XKCD is one on one communication. There's Megan, Rob, "Little Bobby Tables" (possibly named after Rob), people from outside XKCD, and very few others. People that use your name a lot when speaking to you tend to put me on my guard -- it's like something they learned in Sales School. Always coming up with something not quite expected. Last edited by BlitzGirl on Wed Jul 24, 2013 11:02 am UTC, edited 1 time in total. Well, so much for propulsion... we need paddles. And we need to learn how paddles work. It WAS a neat castle indeed, LaPetite.